Long before I learned that it is actually called ginger tea, I have known of this concoction because Filipinos in general like singing, and Salabat is reputed to improve the quality of one's voice. So when salabat is served, don't be surprised if you get asked where the concert is! I always order this at Cafe by the Ruins in Baguio, which they serve in a small pot with a small cup and honey on the side. And since my friends are not fond of it, I get to have the pot all to my self! Perfect for rainy afternoons. Salabat is also served in the provinces after the night mass during Christmas. A perfect complement to rice cakes. Singing aside, ginger does have health benefits. It aids in digestion, it is a soothing drink when you have colds or flu, and loads more. And making this tea is as simple as slicing ginger and boiling some water! Though it tastes great with lemon and honey, simply use sugar if you don't have these and you'll still have great ginger tea. In fact, pictured below is the batch I made awhile ago. I was doing another ginger recipe and discovered that some parts were a bit tough so I just chopped and crushed these up and boiled these in water. But here's an approximate measurement for your reference. Peel the skin off the ginger and slice thinly. 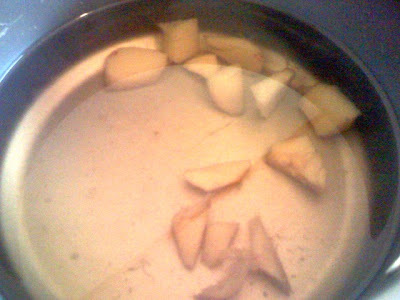 Put ginger in pot with 4 cups water over medium heat. Pour over cups without the ginger pieces and serve with a slice of lemon and honey (or sugar). im not very fond of salabat, but now that you mentioned that i could add lemon to add more flavor to it, i might brew myself a pot tomorrow. Hi eRLyN. Sure, do link up my blog. I will also be happy to add your blog in my blogroll. Salamat! It might take a bit of getting used to when you drink salabat especially if you are not fond of spicy stuff, but it's good once you get the hang of it. Healthy pa!